Garibaldi towers over the Strait (click on photo to enlarge & see details). On a clear winter day the view can be spectacular, looking across the Strait of Georgia to Mount Garibaldi and its neighbouring peaks in the Coast Range. Below them are the islands of Howe Sound: Keats, Gambier, Anvil (aptly named with its sharp, conical peak) and Bowen. Mountains, snow, islands and sea – a beautiful blue/white tapestry rolling out on BC’s south coast. I took this photo from our boat, just off Gabriola Island, on the single occasion that we managed to get out on the water this winter. It was a lovely day, but since then, our winter has been far too nasty for boating (at least by my standards). Nevertheless, some ships must sail in virtually any weather. The prominent vessel in this photo is the Seaspan Reliant, a new freight ferry that travels back and forth between Nanaimo and the Lower Mainland multiple times each day. Beyond, in the distance, is a vessel (conventionally powered) that’s likely more familiar to blog readers: one of the iconic BC Ferries ships, carrying passengers to and from Vancouver Island, also multiple times each day. Workhorses, all! I do hope their crews were able to savour that gentle December day – a rare and well-deserved treat compared to most of their crossings this winter, I expect. This image, along with many of my others, is available for purchase as a print or digital download from my stock photography from Alamy. 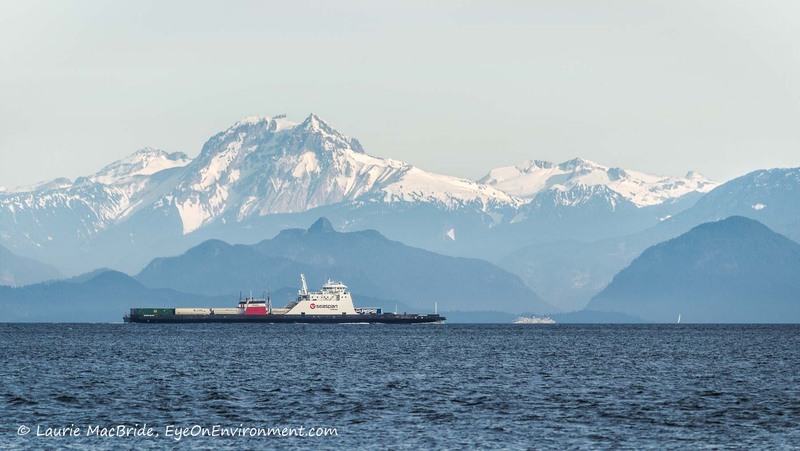 Posted by Laurie MacBride, Eye on Environment on March 5, 2018 in BC coast, Boating, South Coast & Vancouver Island and tagged green alternatives, mountains, nature, ocean, places, ships, Strait of Georgia, transportation, weather, winter.